The old potato sack “ain’t” what it used to be. This version of the classic potato sack is made more “kid-friendly” with the addition of pictures of animals that really do “jump” on the front of the sack—kangaroos, rabbits and frogs—and with two sets of handles to accommodate any age (3 to 103 years young!) One set of handles is on the inside of the sack for little hands and the other is on the outside of the sack for bigger hands. 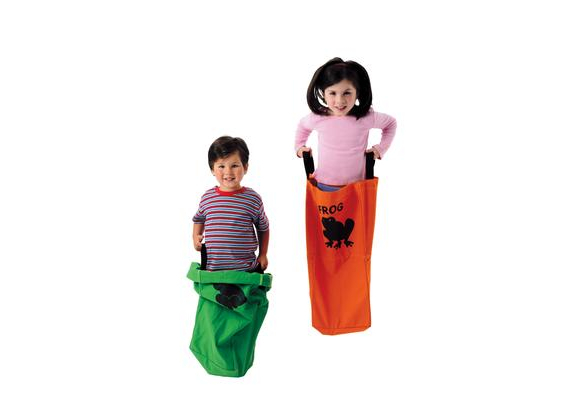 Once your body is standing inside the sack, there is only way to move from one place to another and that is by grasping the handles and using both feet to JUMP up and down. Hopping is on one foot and is not a recommended way to travel while in a sack. It is best to play the following activities outside on the grass or on any cushioned or matted surface. Whether you’re playing a game or competing in a race, you’ll have fun and experience success—no matter what your size! 1. Overall physical fitness—cardiovascular endurance, flexibility, muscular strength and endurance. 2. 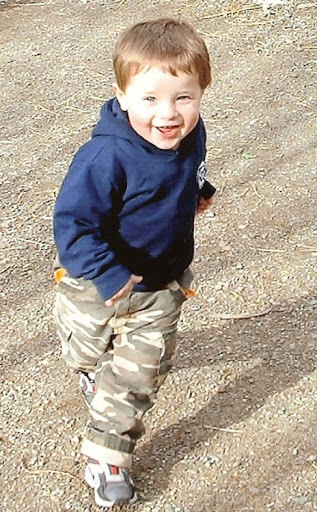 Gross motor development—using the large muscles of the arms, legs and trunk. 3. Bilateral coordination—using both sides of the body at the same time in unison as in jumping. 4. Eye-foot coordination—eyes and feet working together smoothly to meet a challenge. 5. Spatial awareness—coordinated movement in relationship to other objects in the environment. 6. Balance—being able to hold the position of the body through the interaction of muscles working together (maintaining body equilibrium) whether the body is stationary (static balance) or moving (dynamic balance). 7. Cooperation and teamwork—2 or more people working and playing together rather than against one another, just for the fun of it. 8. Fun— playful actions providing amusement and enjoyment. 9. Listening skills—ability to follow verbal directions. 1. Players scattered in open space. 2. One jumping sack for each player. 1. Before starting this activity, discuss with the group about what jumps and what doesn’t. 2. An adult or child who understands the concept of the activity is selected to be the leader of the game. 3. Players stand inside jumping sack but do not hold handles. 4. The leader shouts out various things that jump. 5. Each time the leader names anything that “jumps” the players grab the handles of the sack, pulling it up, and jump up and down vigorously (e.g., “frogs jump,” “rabbits jump,” “kangaroos jump,” “crickets jump,” etc.). 6. If the leader names something that does not jump, players let go of their bags and stand motionless (e.g., “elephants jump,” “worms jump,” “tables jump,” etc.). 1. One animal jumping sack and one hoop or shape spot marker for each player. 2. Arrange hoops or spot markers in a large circle equally spaced apart. 1. Position each player (standing in jumping sack) in a hoop or on a spot (the hoop or spot is their “home”). 2. One player in a sack stands in the center of the circle without a hoop or spot and calls out, “KANGAROO (name of animal sack they are in) WANTS A HOME!” (e.g. “RABBIT WANTS A HOME!”). All animals (including the one standing in the center) must leave their home (hoop or spot) and jump to a different and vacant spot or hoop. 3. One player will be left without a hoop or a spot and should then take his or her place in the center as the next animal home shopper. 4. The game continues until everyone has had a turn to be a new “home shopper.” If “home shoppers” are too slow in finding a new spot or hoop, an adult or leader may pick the next home shopper randomly. 3. CD player and lively upbeat music. 1. First ask the players to jump in place when the music starts. 2. When the music stops, the players are to stop and maintain their balance while standing in the sack. 3. Challenge the players to jump freely around the open space while the music is playing. 4. The game continues with the starting and stopping of the music. 1. “Start” and “Finish” lines or boundaries using cones, ropes or other markers placed a maximum of 12 – 20 feet apart. 1. Each player stands behind the boundary or start line at least an arms width apart from each other. 2. Each player gets into an animal sack, pulls it up, and holds onto the size-appropriate handle. 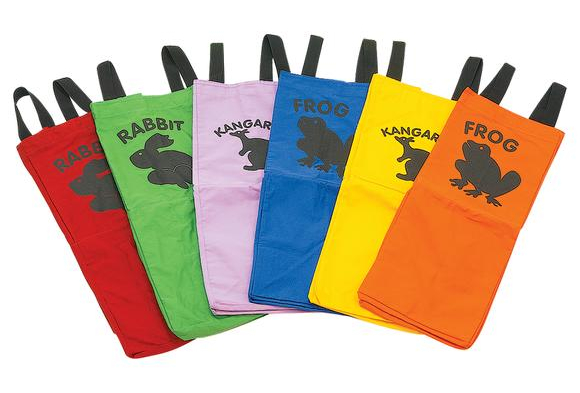 Make sure each player knows which animal sack they are in—kangaroo, rabbit or frog. 3. An adult or child who understands the concept of the activity is selected to be the leader of the game. 4. The leader of this activity calls out animal facts and if the information is correct for the animal—kangaroo, rabbit or frog— that player(s) in the appropriate sack jumps forward one jump. 5. Each time a fact is called out, the matching animal or animals jump forward one jump. If the animal fact does not apply to the animals, nobody jumps forward. 6. The game ends when all the animals cross the finish line. Ask questions appropriate for the ages of children playing. Encourage the children to add more animal facts to this list. This animal lays eggs (frog). This animal is a mammal (rabbit, kangaroo). A tadpole becomes one of these (frog). Bunny is another name for this animal (rabbit). This animal’s skin is smooth (frog). This animal eats grass (rabbit, kangaroo). A group of these animals is a herd (kangaroo). Babies are called joeys (kangaroo). This animal is a marsupial mammal (kangaroo). This animal is an amphibian (frog). 1. “Start” and “Finish” lines or boundaries using cones, ropes or other markers placed a minimum of 12 feet apart (place farther apart for older ages). 2. Each player gets into a sack, pulls it up, and holds onto the size-appropriate handle. 3. On the signal “GO!” players jump to the finish line. 4. Every player who crosses the finish line is a winner! 1. Have players try and beat their own previous time. 2. If not enough sacks for everyone, let those watching be cheerleaders and encourage the players by rooting for their favorite animal—“Go Rabbits!” or “Jump Frogs Jump!” etc. 1. Players pair up or group together by the type of animal on their sack. 2. Each animal team lines up single file behind the starting line. 3. On the signal “GO!” players jump to the finish line, turn around, jump back to the start line. 4. Upon crossing the start line the next player in the same animal team jumps to the finish line, turns around, and jumps back to the start line. 5. Game continues until each animal player in the team has a turn. A. Have same animals stand across from each other on opposite sides of the boundary lines. When one team member jumps across the line, the next team member on that side jumps to the other side and crosses the opposite boundary line. B. Make animal teams consisting of equal numbers of kangaroos, rabbits and frogs. 2. One jumping sack for each two-person team. 1. Players pair up and become a two-person team and pick an animal sack of their choice. 2. Each team stands side-by-side and puts the leg closest to each other in the jumping sack, standing behind the starting line. 3. On the signal “GO!” each two-person team jumps to the finish line. 4. Every team who crosses the finish line is a winner! 1. This race can be done as a relay too, with additional two-person teams in the same animal sacks (kangaroos, rabbit or frog) in a line behind the same type animal team. The first pair crosses the finish line, gets out of their sacks and runs back to the starting line, tagging the next members of their animal team, permitting them to now race to the finish line. The Floppy Flipper! Handmade Fun! No glue, no scissors, no messy paint! Set out some simple art materials and let the children create an all-time favorite toy of unlimited play value–The Floppy Flipper! This handmade piece of simple equipment costs pennies to make, is fun to play with and the benefits are priceless…promoting eye hand coordination, striking skills, crossing the midline, vestibular stimulation, spatial awareness, cooperation and creativity. This is the perfect gift to “give” to your child or the children in your care. More importantly, you can play with them…giving them the best gift of all…your time and participation! A paint stick and packaging tape can be found at the local hardware store. Add a balloon or a small beach ball and let the games begin! Let’s Get Started:1. Using a couple of pieces of clear packaging tape, tape the paint stick to the middle of one paper plate. 2. Give each child another paper plate and ask him or her to decorate it with the available art materials. 3. When the child is finished, staple the plate to the plate which you’ve taped to a paint stick. 4. 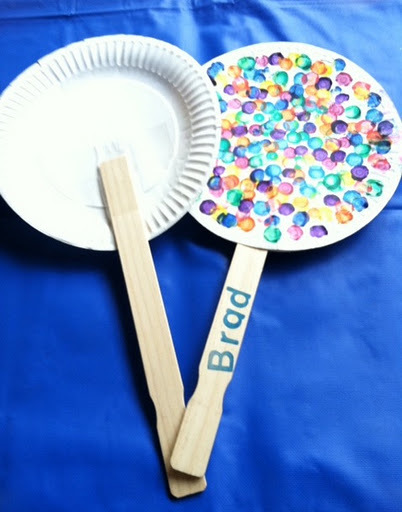 Have the child write or stamp their name on the paint stick handle. 5. The Floppy Flipper is now ready to be played with! Floppy Flipper Wimbledon:Have each child pick a balloon, blow it up (or have it blown up) and tie it. Suggest they write their name on the balloon with a permanent marker. Instead of a balloon have the child decorate their own small beach ball (available at Discount School Supply®). • How high can they hit their balloon? • How far can they hit the balloon? • How long can they keep their balloon in the air? • Can they hit their balloon, spin around, then hit it again? As the children become more proficient, ask them to try to keep a balloon in the air by hitting it back and forth with a partner. Now they’re playing Floppy Flipper Wimbledon! Suggest they change partners once or twice. As a further challenge for older kids, have them attempt to keep two balloons in the air by themselves or with partners! REMEMBER: Balloons ALWAYS require adult supervision. Always use helium quality balloons or sturdy punch ball balloons. Do not use fragile party balloons. You can cover balloons using knee hi stockings, pantyhose or any fruit mesh sacks (citrus, watermelon, cantaloupe). Should the balloon pop, the covering prevents burst balloon shards from being inhaled by children. Jumping Jacks — arms at sides, feet together. Jump up while spreading arms and legs apart at the same time. Lift arms to ears and open feet a little wider than shoulder width. Clap or touch hands above head. Return from jumping up by bringing arms back down to side and feet back together. Continue with 4 more jumping jack repetitions. Have a few minutes and don’t know “what to do next?? ?” Here’s an “egg”-ceptionally active game for the whole group. It promotes moderate to vigorous physical activity and an opportunity to practice gross motor skills and even some creative movement. Let the “egg”-citement begin! 1. Children standing or sitting as they listen and watch as the directions are given and demonstrated. 2. When children hear the command, “scrambled eggs,” they are to jog (running at a slow pace) in the play space without bumping into each other. 3. When the command “icebergs,” is given, children are to freeze (children cease all activity) in place without falling down. 4. Other commands of locomotor transport skills/traveling actions will be given, such as jumping, marching, hopping, galloping, tiptoe, etc. When children hear that command they must switch to the new movement. 5. Example of how game would flow: “scrambled eggs” (jog), “icebergs” (freeze), “jump” (blasting off with two feet and landing on two feet), “scrambled eggs” (jog), “hop” (blasting off on one foot and landing on the same foot), “icebergs” (freeze), “marching” (a precise type of walk, accompanied by lifted knees and swing arms), “icebergs” (freeze). 1. Try to trick children by repeating a command twice in a row. 2. Encourage creative movement by asking the children to “fly like an airplane,” “gallop like a horse,” “move like a train,” etc. 3. Ask the children give the movement commands or let one child be the game leader and give all the commands. 1. 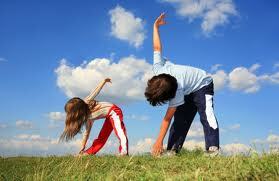 Physical activity: any bodily movement produced by skeletal muscles that results in energy expenditure. 2. Locomotor transport skills or traveling actions: body propels, projects, or moves from one location to another by jumping (with both feet), hopping (with one foot), galloping (step-hop with one foot leading forward), tiptoe (balance on balls of feet and toes with heels raised), skipping (series of step-hops done with alternate feet), among others. 3. Gross motor skills: using the large muscles of the arms, legs and trunk(to perform traveling actions). 4. Space awareness: knowing where the body can and should move in relationship to other people in the play space. 5. Shared space: all of the designated play space that can be used by everyone. 6. Cooperative play: games and activities that the participants play together rather than against one another. 7. Listening skills: ability to follow verbal directions. May is National Bike Month. A fun way to celebrate with young children is to go outside and set up a Trike Traffic Town course on the blacktop or concrete using cones, traffic signs, chalk road markers, directional arrows and children on trikes, scooters or any favorite wheeled toy. (Don’t forget to provide each child with a properly fitted child-size or toddler-size helmet.) This activity also provides a perfect time to reinforce bike safety and the “rules of the road” on your playground. 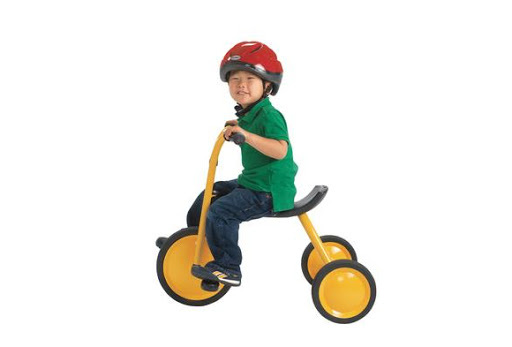 Before children attempt pedaling through Traffic Town, teachers should ask them to stand shoulder-to-shoulder on the side of the course and watch as you direct one child in demonstrating the how-to’s of the course. Verbally describe directions for each part of the course, i.e., “ride around the cones,” etc. Next, line up the first riders on their trikes, at the start of the course and tell them to follow the leader, while you guide them safely through the course. Emphasize that Traffic Town is not a race and they should not speed through the activities. Stress to the children to keep some space between them. If a traffic jam does occur, tell the children to please wait patiently and not to rush their fellow trike riders. 1. Put the GO Traffic Signs, in the hole in top of a cone. Children on trikes begin here. Teachers may want to stagger the starting time of each child. 2. Put ONE WAY Traffic Signs, in hole in top of a cone. Place the 6 Colored Cones about 4-6 feet apart from each other. Using Sidewalk Chalk, make directional arrows around the cones to make a zigzag slalom course. Following the arrows, the trike riders zigzag from the right of one cone to the left of the next, and so on until they complete the 6 cone slalom course. 3. Place 2 ropes horizontally on the ground, parallel to each other and 2-3 feet apart to create a crosswalk. Put the yellow School Crossing Sign in the hole in top of a cone. Set it in front and to one side of the ropes. The trike riders continue traveling but must stop and wait for “pedestrians to cross” (other children or parents/teachers.) If no one is in the crosswalk, riders can proceed forward over the ropes. 4. Place several long strips of bubble wrap on ground. Put the yellow SLOW Sign in the hole in the top of a cone. Set it in front and to one side of the bubble wrap. 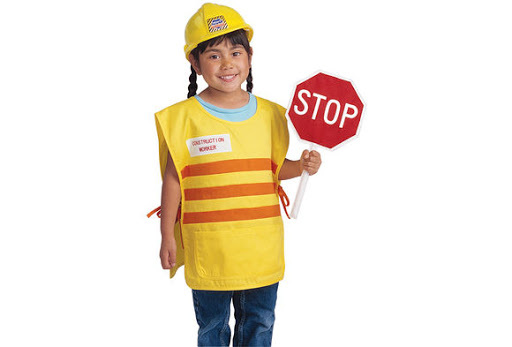 Tell children that there is “Roadwork in progress. It’s a bumpy road,” as they drive their vehicles over the bubble wrap. 5. Set up 4 colored cones side by side horizontally in the middle of the traffic town. Put the DO NOT ENTER Sign in the hole in top of a cone, and place it in front of the 4 cones. (Tell the children that “The road is blocked! It looks like there was a rock slide!”) Place the Arrow Spots on the ground in front and to the side of the cones, indicating the direction the drivers must turn to maneuver their trikes around the blocked roadway. 6. Put the STOP Sign in the hole in top of a cone. Here. “We’ve come to the end of Traffic Town. Let’s do it again!” Using the remainder of the Arrow Spots, direct trike riders back to the beginning of the course. Children will want to repeat traveling this popular roadway over and over again. Be alert to children traveling too fast and not being able to manage the curves safely. Children at this young age are figuring out what their muscles can and cannot do. 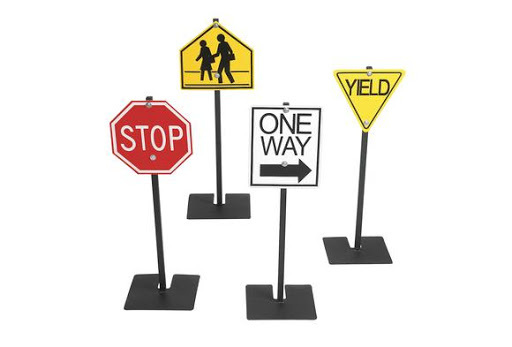 Traffic Town also fosters cooperative play and turn taking as well as dramatic play while preschoolers pretend to be “drivers” and following the road.